Citation: Flav, F et al. I think the fact that this carries a footnote is the best part. In any case, recreational marijuana has been legalized in 9 states and it seems likely more are on the way (I’m looking at you, Connecticut Governor-elect Ned Lamont). People who haven’t ever smoked pot, or maybe haven’t since that one time they tried in college and spent two hours trying to define what a “corner” really is – may be trying it again. And when they try, they may use the new hotness of vaping to deliver THC into their bloodstream. Now, thanks to researchers at Johns Hopkins, we have high-quality pharmacokinetic and pharmacodynamic data to suggest just what the reefer will do in that situation. OK, this is a small study. They took 17 healthy adults who were not frequent users of marijuana – most of them hadn’t smoked in at least a year. Each of those 17 individuals, came in once a week for 12 weeks. During their visit they either smoked or vaped pot (at 10 or 25 mg of THC) or placebo pot. These visits were randomized allowing each participant to serve as her or his own control, allowing for pretty robust conclusions despite the small sample size. After they inhaled – and, btw, they were forced to smoke all of what they were given, they underwent a battery of cognitive tests and had periodic blood samples for THC content. All the tests told the same story – vaping delivered substantially more THC to the bloodstream and had substantially greater cognitive effects compared to smoking. Take a look at the peak THC levels under the different conditions – vaping 10mg of THC led to nearly as high THC levels as smoking 25mg of THC. And the subjective effects were right in line too. 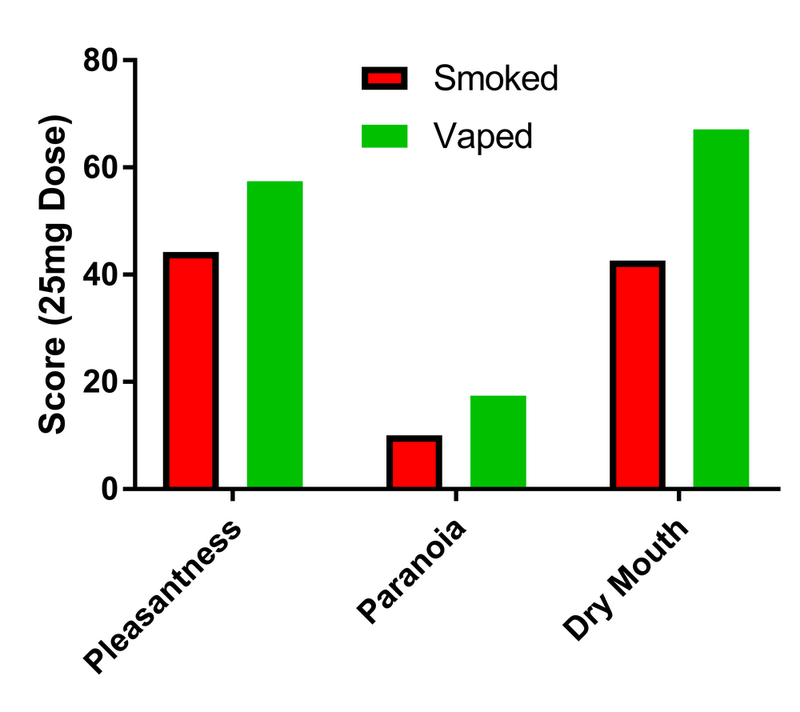 Vaping led to higher scores for “pleasant” feelings, but also more paranoia and dry mouth. Do. Not. Smoke. And. Drive. Cognitive ability suffered more in the vaping group as well – particularly in the divided attention task, so, yeah, don’t, you know, dooby and drive. 25-mgs of THC was enough to make two participants vomit, but those doses actually pale in comparison to what is available at recreational marijuana shops. In Massachussetts, for example, a 1-gram joint called “Facewreck” containing 22% THC runs you 15 bucks. That’s roughly 10-fold higher amounts of THC than what was used in the high-dose group in this study. So what’s the take-home? People who haven’t smoked pot in a long time – be careful – the effects are real. If you’re going to do it, realize that vaping will deliver more drug, don’t operate machinery under any circumstances, and remember that just because a study is small doesn’t mean it should totally harsh your mellow.